We want you to see the toys we see, so you can determine if they're right for your store! Check this space every weekday to see brief video clips of new and specialty products. In the spotlight today? This adorable Lucky Tea Time Set from HABA USA/HABERMAAS CORP.
Lucky Tea Time Set by HABA USA/HABERMAASS CORP. This set includes 2 cups with saucer, 2 spoons, 2 cookies and 2 tea bags. The dishes are made of shatterproof melamine and are dishwasher safe for easy clean up. The realistic cloth tea bags can be put in the washer. Not recommended for use in microwave. Travel Buddies by NOODLE HEAD INC.
Other products from NOODLE HEAD INC.
Noodle Head Inc., manufacturer of toys and activity kits for children, has introduced the first of several new travel accessories for children. Travel Buddies is a series of plush neck pillows especially made to accommodate sleepy little heads in cars, on planes or anywhere else. Irresistibly soft and cuddly, these pillows are perfect for naptime on the go. There are six adorable animals to choose from: bear, frog, giraffe, dog, cat or lion. This horse and carriage push toy features a built in handle in the horse. The horse and carriage can be separated so they can be played with separately. Made in the USA of 100% post-industrial recycled wood residuals; non-toxic with ultra low odor paint, zero VOC. With The Klutz Guide to the Galaxy, kids can explore the universe without leaving the comfort of their backyard. This galactic tool kit has everything kids need: a build-it-yourself telescope, a night-sight flashlight, star and moon maps, a no-batteries-required sundial, a mariner’s quadrant to steer by the stars, tons of intergalactic activities, and more. — Why it won: Who knew you could build a telescope with a book? Everything needed to create a spyglass for space is contained within the Guide to the Galaxy's pages. There are lots of facts about the universe, plus other projects that kids can build to help navigate this world and others. It's a great gift that will appeal to both boys and girls. Mashoonga Cadet by REVEL KING, INC.
Other products from REVEL KING, INC. The Mashoonga! Cadet is a foam saber for young children. 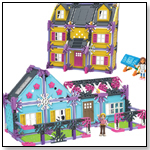 It is made of premium materials that will provide months of fun and vigorous play. 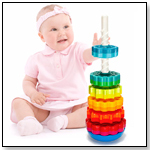 It is constructed to be safe and has a play pattern that promotes eye hand coordination, strategic skills and builds stamina. It teaches children good sportsmanship by following rules of play and how to safely play a contact sport. 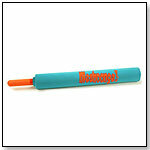 It is an all season toy that can also be used in and around water play. "The Mashoonga! Cadet is a premium product made to last. We replace it if it brakes under normal use," Jim Bogner, president of Revel King, told TDmonthly. Launch date: November 2010.